“Let us not seek the Republican answer or the Democratic answer, but the right answer. Let us not seek to fix the blame for our past.” – John F. Kennedy. “Suppose you were an idiot and suppose you were a member of congress; but I repeat myself.” – Mark Twain. Both of these quotes are from intelligent people — one of them may be more applicable to our current political crisis, but that makes the other none less true. On March 23rd, 2010, the Affordable Care Act, or Obamacare, was signed into law. When it was first introduced the GOP said that it was a breach of constitutional rights, and that the government was forcing it down our throats. However, when the supreme court voted as to its constitutionality, they found that it was completely legal. The republicans said it would cost that government too much money, but studies were conducted, and the truth of the matter is that uninsured people of America cost the government far more money than Obamacare ever would. Now the republicans, namely Ted Cruz and the Tea Partyers, have run out of sane reasons to oppose the Affordable Care Act, and have devolved into playground name-calling based on nothing but hot air. This small sect of conservative loons, which make up 1/30th of the government, decided that the uninformed republican populace was so against Obamacare that it had to be defunded, and if not they would shut down the government. 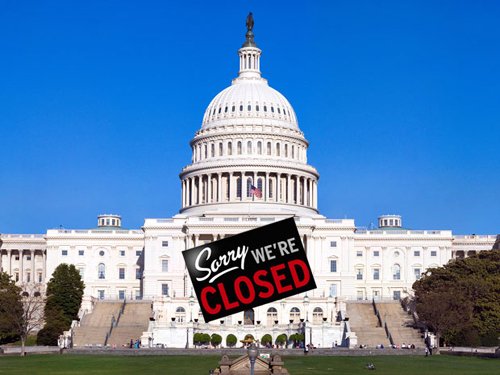 The shutdown went into effect October 1, and as of this post, it remains closed. You may be wondering what sort of person would vote for someone who is willing to take such underhanded actions to get their way? Well, it turns out that these people are from parts of middle America where all you have to do to get elected is say that you hate Obama and love apple pie. John Boehner, the house majority leader, could have decided to vote on this issue, after all this is a democratic nation, but he was well aware that sensible republicans like Peter King from our very own New York would vote to keep the government open, and that would be bad for him and his immature constituents. This shutdown did not simply come out of the blue, it is more than an instant and ridiculous response to republicans not getting their way. The shutdown was a plan since the beginning of President Obama’s second term. Wealthy super-conservatives decided that nothing was too costly in the imaginary fight to stop Obamacare. The ensuing shutdown has caused the, still recovering, stock market to begin its downward descent once again, and has left 47 million Americans who use food stamps, starving. Recently some WWII veterans tried to gain access to their own monument; because of the shutdown they were kept out. Some republican congressmen tried to use this as an opportunity for a photo-op and to get good press. Clearly this is an atrocity, except that its severity is magnetized by its publicity, the real atrocity is the furloughed government employees who need their job to keep food on the table. Yet, because this was on TV, John Boehner decided something had to be done, so he introduced a plan to fund certain parts of the government that he liked, such as parks. If you’re willing to fund parks why not fund cancer research? Clearly this shutdown affects many people, but the GOP want to use it as a tool to threaten the democrats into defunding a necessary law. The republicans are acting like children, they are upset because they lost the election, so now they are throwing a tantrum, unaware of the damage it is doing to innocent Americans. ← Health for the Young?